Autumn is the perfect time to explore the Connecticut Wine Trail. Allow the leaves to light your way, as you meander from vineyard to vineyard for tastings, tours, music and special events. Be sure to have your Passport to Connecticut Farm Wineries stamped at each stop for your chance to win travel, wine and other prizes. In this story I wrote for Yankee Magazine, I take leaf lovers along on a winding journey through one of my favorite areas in my home state. Follow the tour I devised, and you'll visit a pottery studio, a garlic farm, a scenic dam, one of the state's best mountains to hike, a chocolate farm (really! ), a winery and more. I'll also take you to some of Connecticut's most picture-perfect leaf-peeping spots. The Connecticut Office of Tourism shares this one- to two-day itinerary for exploring the Lower Connecticut River Valley during this most colorful time of the year. You'll even visit Connecticut's famous castle, which hovers over the Connecticut River and makes a picture-perfect destination in the fall. Designated a National Scenic Byway, Connecticut's Route 169 is a historic roadway that will take you to museums, craft and herb shops, and past an estimated total of 189 structures which date before 1855. Oh, and there'll be pretty leaves, too! Scenic Byways has all of the information you'll need before you hit the road during fall foliage season. There's something so romantic about stumbling upon a covered bridge nestled within a picture-perfect fall landscape. If you don't want to leave finding a "kissing bridge" to chance, follow these driving directions from the Connecticut Office of Tourism, and you'll be able to drive across three scenic bridges and picnic beside a waterfall, too. 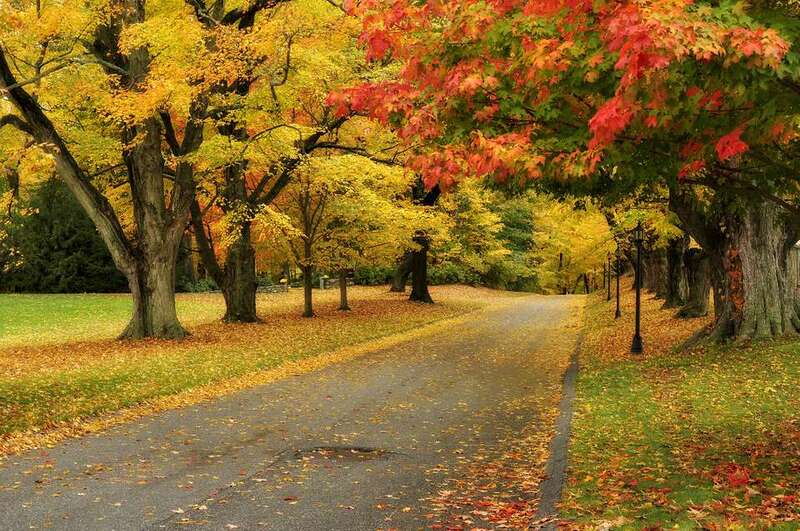 The Western CT Visitors Bureau offers several suggested driving tours that are perfect for fall. Find tours geared to antique hunters, countryside seekers, photographers and history buffs. The Merritt Parkway, Connecticut Route 15, winds through Fairfield County, and while it's a prime commuters' route Monday through Friday, it provides incredible scenic driving on the weekends. It has been designated a National Scenic Byway, and Scenic Byways has all of the information you'll need to map out your trip. Visit Connecticut offers these suggested routes to explore this autumn in the Litchfield, Mystic, New Haven, Hartford and Waterbury areas of the state. The penalties are steep: Here's what you need to know before you hit the road this fall.